In the 1980s and first part of the 1990s when few outside of digital arts field used computers, the existence of the separate field of “digital art” was necessary. It provided a context and support network to the field’s practioners. In the last few years, however, the situation changed dramatically: pretty much everybody in the cultural field now uses digital media, computer networks, and the like. So what is exactly then do we see today in exhibitions of “software art,” “digital art,” “new media art, “ “cyberart,” etc.? For instance, can “digital art” be considered a branch of contemporary art? Since the end of 1960s, modern art has become fundamentally a conceptual activity. That is, beyond conceptualism proper, art came to focus not on medium or techniques but on concepts. How these concepts are executed is either secondary, or simply irrelevant. When an artist asks gallery visitors to complete a questioner and then compiles and exhibits statistics (Hans Haacke), takes up a job as a maid in a hotel and documents hotel rooms (Sophie Calle), cooks a meal for gallery visitors (Rirkrit Tiravaniija), presents a found video tape shot by Russian troops in Chechnya (Sergei Bugaev, a.k.a. Africa), the traditional questions of artistic techniques, skills, and media become largely unimportant. As the well-known Russian artist Africa has put it: “the role of modern art is not to uncover a secret but instead to steal it.” Put differently, more and more contemporary artists act as a kind of journalists, researching and presenting various evidence through different media including text, still photographs, video, etc. What matters is the initial idea, a strategy, a procedure, rather than the details of how the findings or documentation are presented. Of course not all artists today act as journalists – I am simply taking this as the most clear example of the new role of an artist, in contrast to the older roles of artist as craftsman, as the creator of symbols, allegories, and “representations,” etc. In short, a typical contemporary artist who was educated in the last two decades is no longer making paintings, or photographs, or video – instead, s/he is making “projects.” This term appropriately emphasizes that artistic practice has become about organizing agents and forces around a particular idea, goal, or procedure. It is no longer about a single person crafting unique objects in a particular media. Although its highly social nature (people exchanging code, collaborating on projects together, treating audiences as equal participants, etc.) aligns “software art” with contemporary art, since it is firmly focused on its medium rather than medium-free concepts, “software art” cannot be considered “contemporary art.” This is one reason why it is indeed excluded by the art world. The logics of “contemporary art” and “digital art” are fundamentally at odds which each other, and I don’t see any easy way around this. So, for instance, when Ars Electronica 2003 program asks “In which direction is artists’ work with the new instruments like algorithms and dynamic systems transforming the process of artistic creativity?” (festival program, p. 9), the very assumptions behind such a question put it outside of the paradigm of contemporary art. If “software art” does not belong to the cultural field of ‘contemporary art,” does it perhaps follows the earlier logic of artistic modernism? In other words, are we dealing here with a kind of “Modernism ver. 2,” since “software” and “digital artists” clearly spend lots of energy investigating new possibilities offered by digital computers and computer-based networks for representation and social communication and cooperation? This interpretation does not work either. Contrary to what you might have learned in art school, modernist artists were not formalists – at least in first half of a twentieth century. The incredible and unprecedented energy which went during these decades into inventing fundamentally new languages of visual communication, new forms, new artistic concepts of space and time, and so on, was rarely driven by purely formal concerns – i.e. investigating the specificity of a particular medium and purifying it from other influences to create works which did not refer to anything outside themselves (Greenberg). Instead, artists’ inventions were driven by multitude of larger questions and goals – representing absolute values and spiritual life; creating new visual language for a working class; representing the dynamism of contemporary city and the experience of war; representing the concepts of Einstein’s relativity theory; translating principles of engineering into visual communication; and so on. In contrast, today’s “digital artists” are typically proper formalists, with their discussions firmly centered on their particular medium – i.e. software. In short, they are not “new modernists,” because modernists were always committed to larger political, social, and spiritual values. If there is one social field whose logic is similar to the logic of “digital art,” or “new media art” in general, in my view this field is not contemporary art, modern art, or design, but computer science. 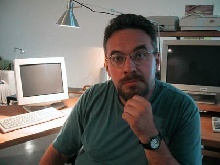 Like digital artists, computer scientists working with computer graphics, multimedia, networking, interfaces and other “cultural” parts of computer science (as opposed to, say, chip design or computer architecture) are true formalists – that is, they are investigating new possibilities for representation, social and human-machine communication. Like digital artists, these computer scientists routinely translate their ideas into various working demos and prototypes which often do not have life outside of their own professional domain: academic papers, conferences, demo presentations. (However, In contrast to the works of digital artists, some of these ideas do enter into mainstream computing and thus have huge impact on culture: think of GUI, hyperlinking, or World Wide Web). At the end of the day, if new media artists want their efforts to have a significant impact on cultural evolution, they indeed to generate not only brilliant images or sounds but more importantly, solid discourse. That is, they need to situate their works in relation to ideas that are not only about the techniques of making these works. The reason that we continue discussing Duchamp’s ready-mades or as Paik’s early TV sculptures as though these works were created today has nothing to do with the artistic and technological skills of these artists – it has to do with their concepts, i.e. the discursive statements these artists were making through their objects. In short, if modern and contemporary art is a particular discourse (or a game) where the statements (or moves) are made via particular kind of material objects identified as “artworks,” digital artists need to treat their works as such statements if they are to enter the larger cultural conversation. This means referring to the historical and presently circulating statements in the fields of contemporary art and/or contemporary culture at large. If brilliant computer images are not supported by equally brilliant cultural ideas, their life span is very limited. Either they are destined to be simply forgotten, the way it happened with the great deal of media art – simply because the software and the hardware they required to run on no longer exists. Alternatively – and it hard to say which fate is worse – they would end up as buttons or plug-ins in mainstream graphics and multimedia software. This the ever-present danger of anybody working on the cutting edge of technology – if the results do not become part of other cultural conversations, they inevitably stay within the field of technology itself: either simply erased by new generations of software and hardware, or incorporated within it as elementary building blocks. In saying all this I don’t want to imply that contemporary art is somehow “better” than digital art. Every culture has a need for different discourses, different statements, and different practices; historically they are distributed differently between different cultural fields. Today, for instance, you will find that the development of new styles is mostly done within the design; the tradition of portraiture (representation of a particular human being) is primary carried on in commercial photography; literature and cinema have taken on the role representing human existence via narratives, which in classical period was the function of theatre; and so on. Some fields within computer science, the research-oriented wing of designers, and digital art are playing their own unique and extremely important role: devising new representational and communication methods and techniques. As for contemporary art, it does not actually have a well-defined role within this cultural division of labor. Rather, it is a field there one can make statements which are not possible to make in all any other field, be it science, media, etc. These statements are unique in terms of their subject matter, how they are arrived at, and how they are presented. Not every contemporary artist fully takes advantage of this unique situation, but the best do. While the fields of contemporary art and digital art play very different roles and both are culturally important for different reasons, they are also are both limited in a complementary way. Contemporary art is too historical: a typical statement in this field either by artist or by critic inevitably refers to another statement or statements made during the last few decades in the field. Digital art has the opposite illness: it has no memory of its own history, so it can benefit from remembering its past more systematically. If the two fields can learn from each other, the results can be very exciting.